Painting is finally scheduled for the upcoming weekend. I know we were all expecting more progress on this front, but painting is something we don't want to rush into. It takes a lot of careful preparation and setup. We have to pull all the body panels off the car, do some final trimming, and then sand all the fiberglass and etch all the aluminum. It's going to be a real challenge to get all that done by Saturday, but we're excited about it. Part of the prep work involves hiding the rivets on the rear fenders. We finished that up last weekend. It only took about five coats of putty and primer, although we can't really claim that all of the rivets are invisible. But most of them are, and we expect the thick 2K urethane primer to cover the rest. The good thing is, the fenders are really stiff with the flanges attached, and light too, just a couple of lbs. each. 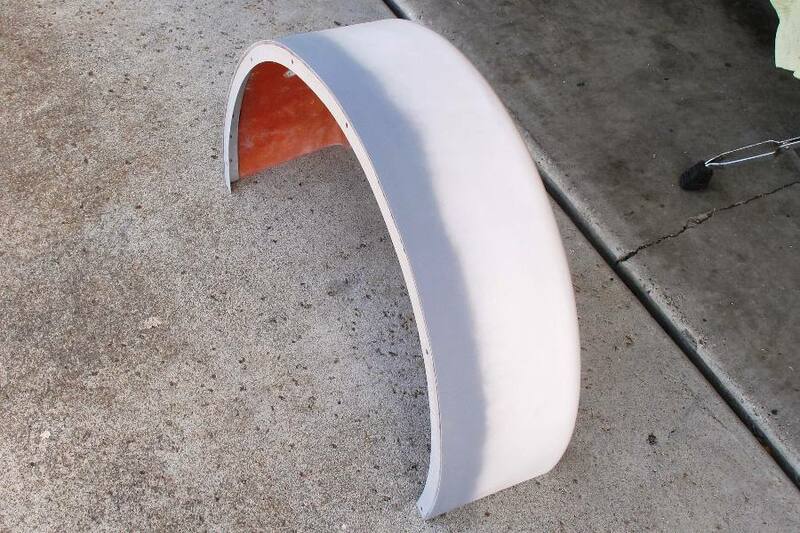 The fenders actually turned out to be of the few things on the car that we got right the first time. 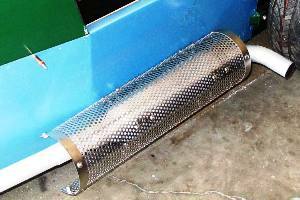 Unlike the exhaust heat shield. The Locost book has nice pictures showing exactly how to make the 6 brackets that attach the heat shield to the muffler, but they're drawings, not photographs. It turns out you can draw things in steel that you can't actually make, like for instance sharp 90-degree bends. Our bends weren't quite as sharp as that, so our brackets ended up about half an inch too tall, which turned the heat shield into a giant cylinder about the size of a washing machine drum. We'll try making the brackets again in a few weeks. 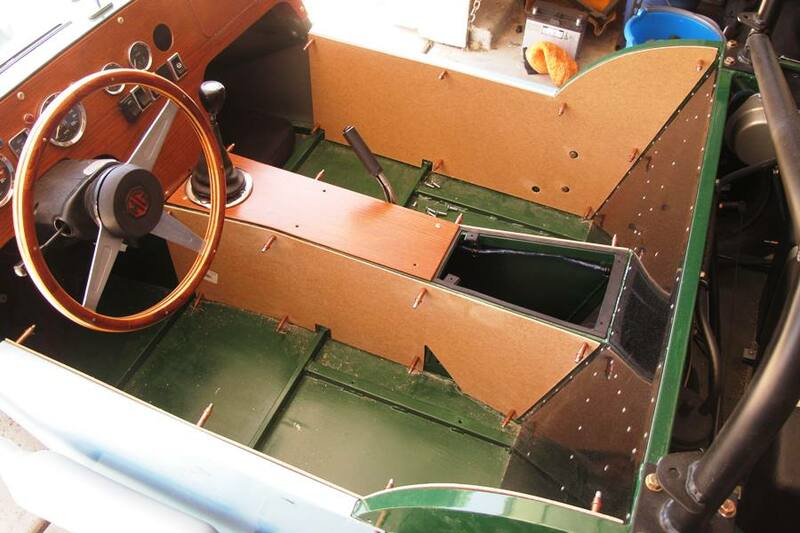 We did a better job fitting our fiberboard interior panels to the car, although it took a while. We trimmed the panels for things like seat belts and handbrakes, then drilled 1/8" holes at various places around the panels so that we can eventually attach them to the chassis with sheet metal screws and cup washers, just like they did fifty years ago. First, though, we need to cover the panels with foam and vinyl, but we're not going to do that yet because we don't have any foam or vinyl, and besides, it's way too early to be finishing up the interior. Although that didn't stop us from fitting the carpet. 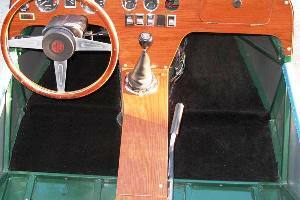 We do have carpet, enough to cover the floor from the front of each seat to the firewall and the front of the transmission tunnel under the dash. Unfortunately it's not genuine M.G. carpet, but it's a nice black color and the vendor described it as "luxury" automotive carpet, so it'll probably be good enough. It's pretty thin, though, and cuts easily with scissors, but maybe that's part of being "luxury" carpet. Maybe the cheap stuff is harder to cut. Okay, probably not. 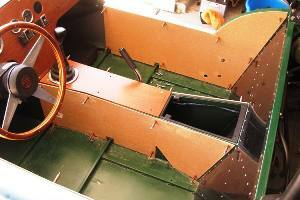 Eventually the carpet, seats, and interior panels will cover up everything inside the car except the outboard footwells. We're okay leaving the footwells open because we need all the space down there we can get. We fit the carpet into the car but we didn't glue any of it to the floor. 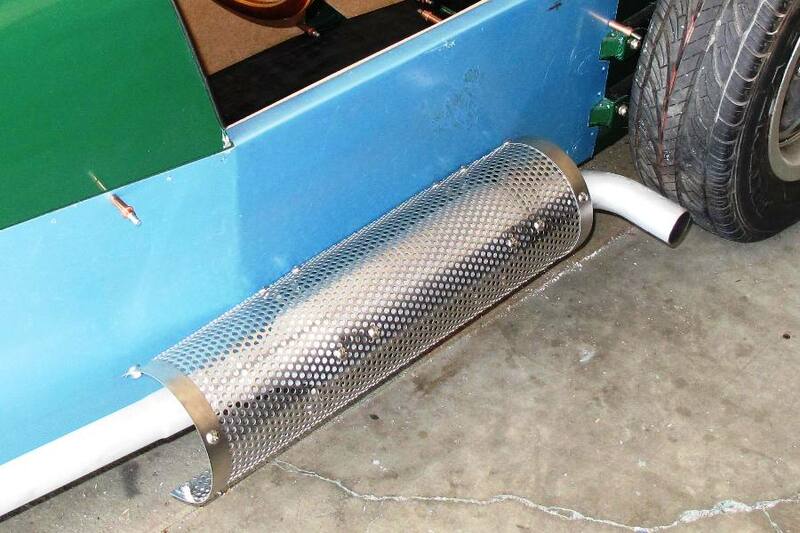 It'll be a lot easier to do that when the body panels are off the car and we can reach in through the frame tubes. Down the road if the carpets ever fade or wear out, we can just get some of that carpet spray paint and spruce them up a bit. We're coming up on our July 26th deadline for finishing the bodywork, and it looks like we're not going to make it. Our checklist has 19 tasks left, and over 100 hours, so we're probably going to fall a couple of tasks short. The painting should be done by then, but it's unlikely that the body panels will be back on the car. So we're extending the deadline, but in doing so we're taking a page from the semi-failed San Francisco Bay Bridge project and chalking the extension up to our overriding concern for safety. We think that on or around August 15th we'll be able to close the book on the bodywork phase of this never-ending project, and move on to something else. We're not behind schedule, mind you, and we're not late. 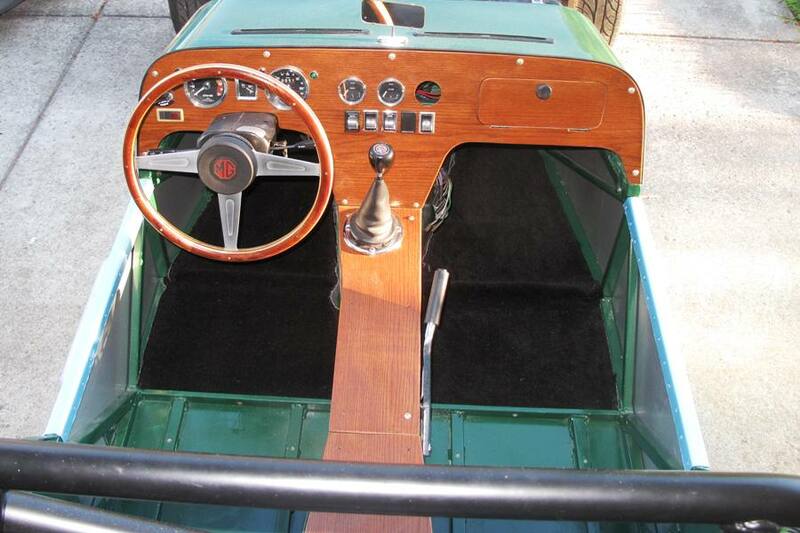 We just want to be absolutely sure the car is safe from a coachwork perspective before we let anyone drive it.